Chris Dolgos, sixth-grade teacher and founding staff member of Genesee Community Charter School in Rochester, NY, has been named the 2016 recipient of the Klingenstein Teacher Award. 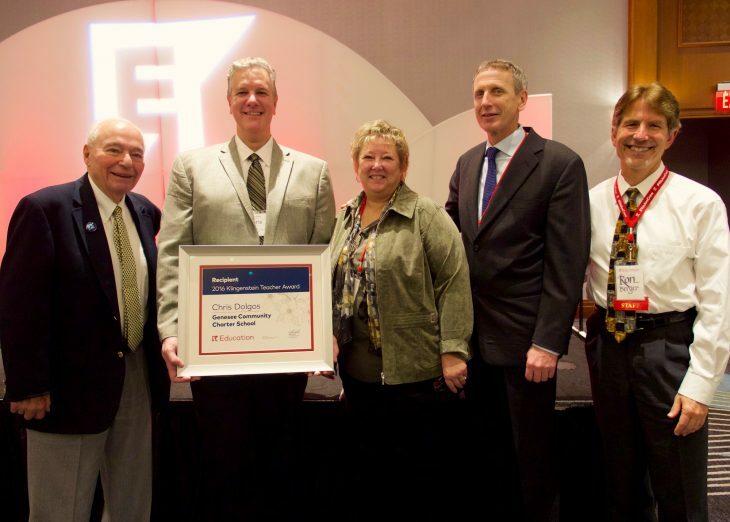 On October 27th, Chris joined Lee Klingenstein, our Founding Board Chair, on stage at the EL Education 2016 National Conference in Detroit to accept the award along with a $5,000 prize and an invitation to lead a Master Class at our 2017 National Conference. "I am proud to be an EL Education teacher - proud to be part of a network that empowers teachers and honors the work of students and honors the idea that students can do more than they think is possible. What a disruptive idea. For too long, school was something that was “done to kids” rather than having kids be leaders of their own learning. EL teachers like us have changed that notion and we are helping thousands of kids realize that their voices deserve to be heard, that they, too, have choice and agency, and that they can be the change they want to see in the world. “Another thing that sets EL teachers apart is our relentless focus on character. Whether you call them habits of work and learning or 21st century or “soft” skills, these dispositions are what our students leave our schools holding on to, woven, we hope, into their moral fiber. Pride of work. Courage in their resolve. Empathy and caring towards those who need it most. Responsibility to their crew and community. These skills don’t often translate well on a bubble sheet or on a data wall - but every one of us knows that the young men and women we are teaching today deserve to be recognized as more than a test score, more than a dot on a graph. Knowledge matters - but so does heart. Each year, an outstanding member of the EL Education community is selected by a committee of peers to receive the Klingenstein Teacher Award. Honorees exemplify the spirit and values of EL Education. Watch Chris' full speech here.